Mapix technologies Ltd is a global operation. Mapix provides products and solutions which enable customers to collect, manage, visualise, analyse and share high value geo-referenced LiDAR data to improve commercial decisions and performance. 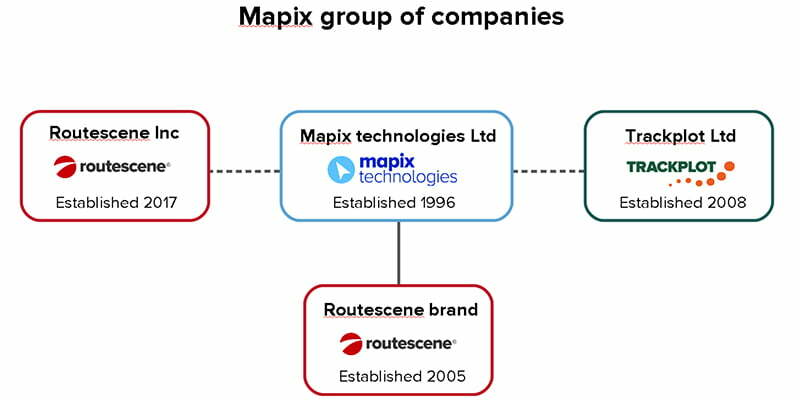 The Mapix group of companies includes Routescene®, Routescene Inc and Trackplot Ltd.
Routescene® is a registered trademark of Mapix technologies Ltd, and Routescene Inc is our American sister company through which we do business in North America. Trackplot is the lone worker solution of choice for people who work remotely outdoors across the UK. Focusing on forestry and estate management, our easy to use interactive system is robust and reliable. Combining satellite and GPS technology, mapping, software and customer support processes, we help employers keep lone workers safe and comply with the law. We are the only company truly focusing on remote outdoor lone workers. Our company cultural values declare the principles and approach to business that steer Mapix technologies Ltd, Routescene and Trackplot. We recruit staff who exhibit a high competency in each of these values and put them into practise daily for the good of customers, partners, the industry and the business.